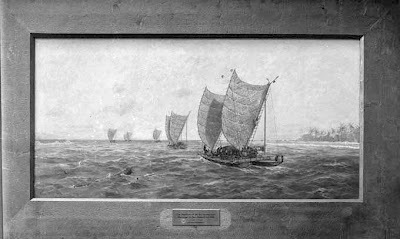 This voyage, named Waka Tapu, was the dream of Doubtless Bay master waka-builder Hekenukumai Busby, who built and carved the waka hourua. The waka which brought early Polynesian explorers across the Pacific and to NZ would have looked similar. 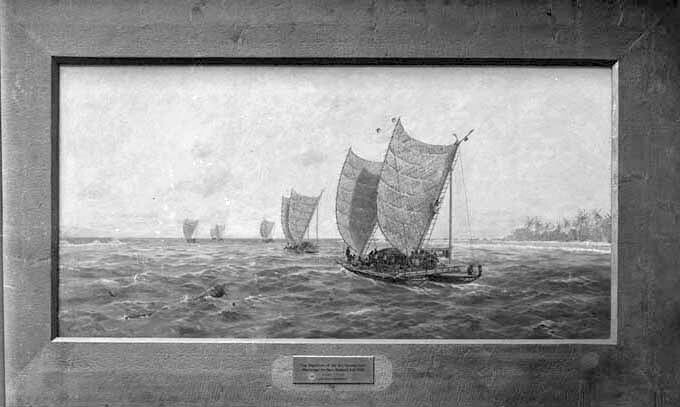 Ref: 1-W1339, photograph of a painting by Kennett Watkins, showing a group of 6 canoes leaving Rarotonga for New Zealand in AD 1350, Sir George Grey Special Collections. Te Wananga-a-Kupe Mai Tawhiti is a new school which has opened at Doubtless Bay. This school will teach all aspects of kaupapa waka, complementing that which Hekenukumai Busby and his whanau conduct at Aurere.